The SHNH summer meeting and AGM will be held in Cumbria on the 15th & 16th June 2017 (AGM on 15th June) at the University of Cumbria Ambleside Campus and the Freshwater Biological Association, Far Sawrey on the west side of Lake Windermere, opposite Bowness on Windermere. This meeting recognises the historical contributions of women to the earth and life sciences, especially the contribution of some of the lesser known amateur women, as well as that of the early professional women scientists working in all aspects of the environmental sciences. Registration Women in the History of Natural Sciences. The programme for Thursday 15th June will be opened by Professor Julie Mennell, Vice Chancellor, University of Cumbria and speakers will include Andrea Hart giving an overview on Women as Natural History Artists, drawing on the rich collections at the Natural History Museum in London, Charles Nelson on Katherine Sophie Baily: author of the Irish Flora (1833), Heleen Plaisier on Margaret Gatty (1809-1873), writer, collector, scientist, and Sam George on Entomology for Girls: Priscilla Wakefield’s and Louisa Beaufort’s “Familiar Dialogues on the History and Classification of Insects”. A visit to the Armitt Museum has also been included in the conference programme for that day, as well as the Annual General Meeting, which will take place in the early afternoon. On Friday 16th June, at the Freshwater Biological Association, Pearson Building, the initial focus will be on the women working in aquatic sciences, with speakers including Claire Waterton on The role of the FBA in fostering pioneering women aquatic biologists, Catherine Duigan on Kathleen Carpenter (1891-1970) a life in fresh water, and Mary Morris on Dr Rosemary Lowe -McConnell (1921-2014). The afternoon session will include an overview on Female phycologists, by Jenny Bryant, Arthur Lucas presenting a paper on behalf of Australian colleagues on Flora Martin, nee Campbell (1845-1923) on the threshold of mycology in Australia and Al Reeve on Dr Mary E. Gillham (1921-2013) a dedicated naturalist. Poster displays at both venues will contribute information on other women whose roles in natural sciences are only now being recognised, from Lady Flora Hastings in India to Muriel Robertson, a Glasgow protozoologist. The http://www.visitcumbria.com/ web site has useful links to both accommodation of all kinds, as well as transport and timetables. There are also 10 ensuite rooms available in the Fairfield halls of residence. The ensuite rooms are charged at £32 per person/per night. Both buildings are near the Rydal Road, Health Centre bus stop. 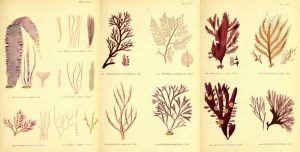 Images: Selected plates from Margaret Gatty’s British Sea-Weeds and the Title Page from The Irish flora : comprising the phaenogamous plants and ferns (1833) by Katherine Baily.